The Aprilaire Dehumidifier 1750A is an energy efficient whole home model. This unit may be integrated with your existing HVAC system to control humidity throughout the whole of your home or, when your HVAC system is not in use, switched to control moisture in a single area, typically a basement or crawl space. 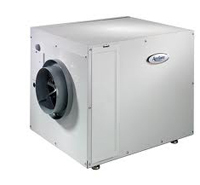 The 1750A is powerful enough to manage humidity throughout a home of up to 2200 square feet. Although not Energy Star qualified this model is 50% more energy efficient than a large portable unit and even less expensive to run than the multiple portables that might otherwise be needed. The Aprilaire Dehumidifier 1750A is manufactured in the USA and is constructed to far higher quality standards than more familiar brands such as LG and Frigidaire. Naturally this model comes with a much higher price tag but also benefits from a five year warranty, an indication of a much longer working life. This model offers a high degree of flexibility in operation and a multitude of installation options, from your crawl space to your attic. If you would like to see an illustration of a typical installation please download the sales brochure from the section entitled "Manufacturer's Information" further down the page. It contains a very clear and helpful picture. The most common location for this type of dehumidifier is alongside your furnace and this keeps the unit out of the way and reduces the noise nuisance. On the question of noise the 1750A is extremely quiet for such a powerful unit and most owners find it easy to live with. Consumer reviews of the Aprilaire Dehumidifier 1750A are very positive and most users are more than pleased with the results they obtain from it. In view of these positive reactions and the successful track record of the manufacturer I am more than pleased to recommend this model to our visitors. The Aprilaire Dehumidifier 1750A is carefully designed for its intended use as a whole home unit. It is among the more sophisticated models in its class and is one of the best solutions available for a high humidity problem throughout your home. Although this model may be considered by some as a potential basement unit I would advise against it for that application. Although the low noise level may make it attractive to some a purpose-designed basement model is likely to prove cheaper to run. I have already described consumer reactions as positive. Specific comments confirm the effectiveness of the appliance, its low running costs and the extra financial benefit of being able to run an air conditioning system at a slightly higher temperature setting due to the sensation of a lower heat level we experience when air is drier. If you are struggling with excessive humidity throughout your home there is no more effective or economical solution than a whole home dehumidifier and that would be my first recommendation. There are alternatives to the 1750A, from the Ultra-Aire and Honeywell brands in particular, but which you choose will depend on the slight differences between each model and the value you place on particular features and characteristics, such as quieter operation. In my view the Aprilaire Dehumidifier 1750A is an excellent unit and I recommend it to our visitors without reservation.